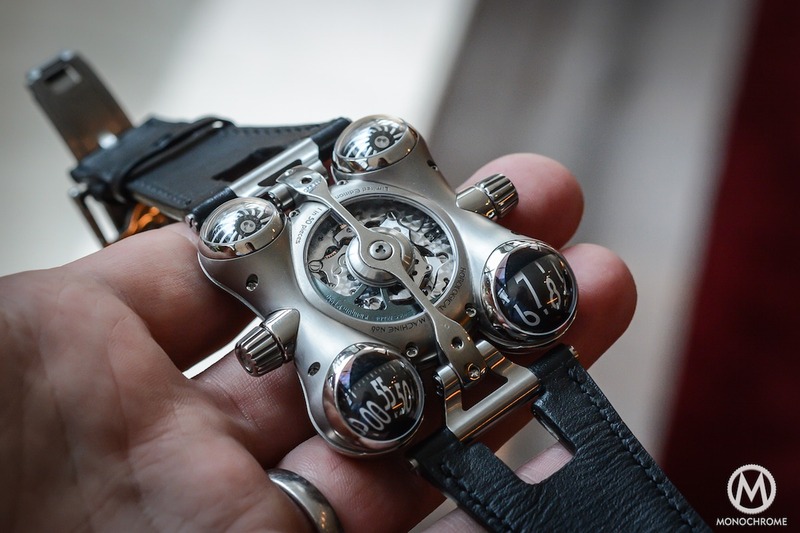 MB&F is all about Friends and partnerships – the main objective when creating the brand was to gather the best of the watch industry to achieve unique timepieces. But inspirations are also a leitmotif and the reason of this so-special design. 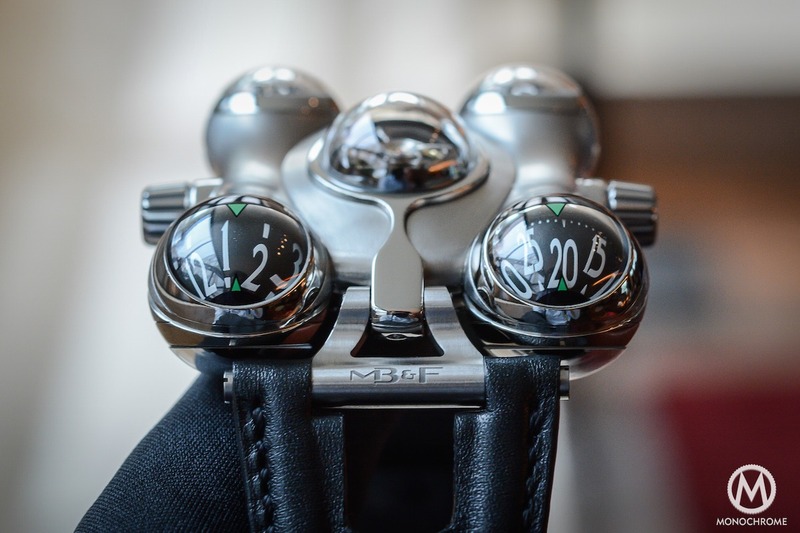 After using 1970s cars, 19th century’s steampunk or 1950s planes as a source of creation, MB&F is now coming with another of its delirious watches, this time inspired by a 1970s TV series… Once again, it is strange, radical, never seen before and complicated. 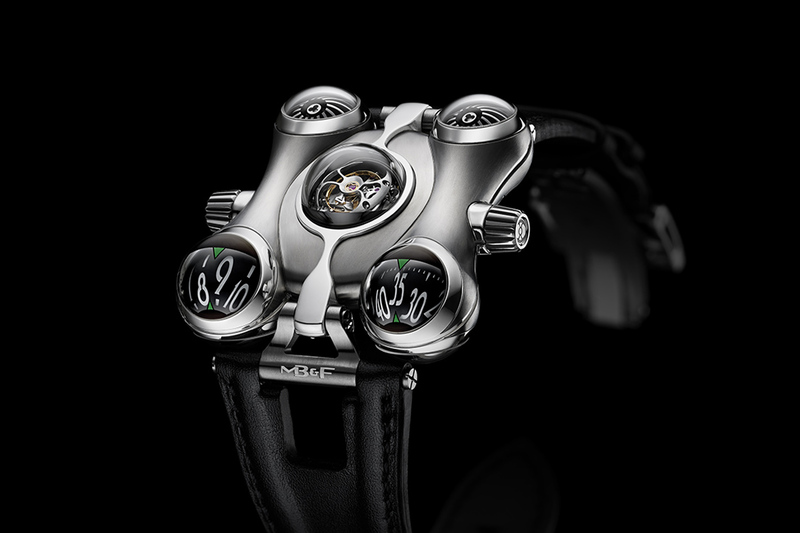 Here is the MB&F HM6 ‘Space Pirate‘. 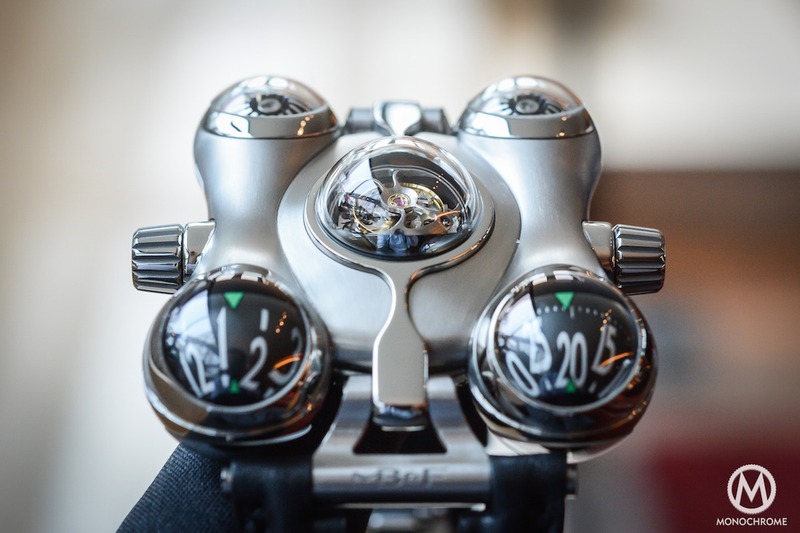 Like it or not, the new MB&F HM6 will again create some debates and catch the attention of the industry and community of collectors. 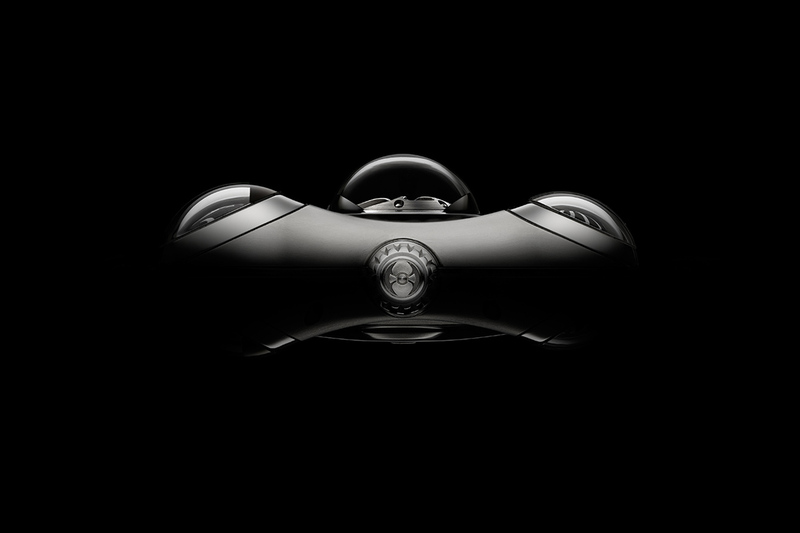 The strength of MB&F has always been to be different. 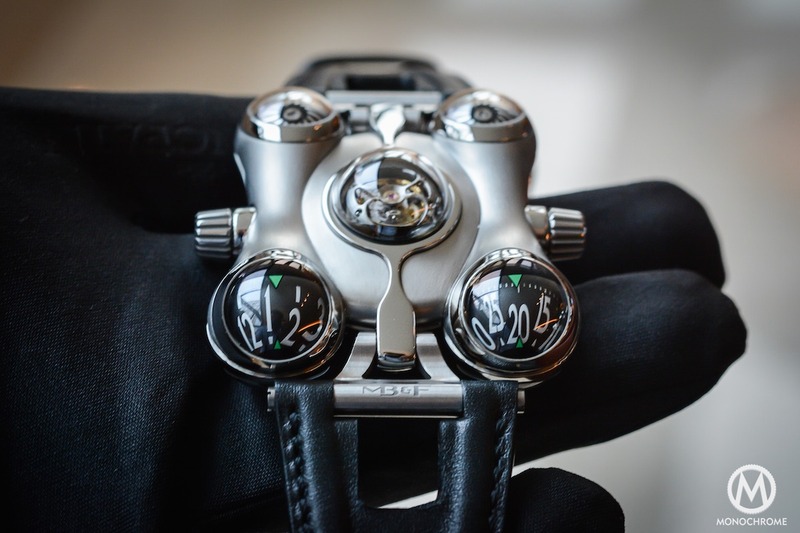 Once you have a watches made by Max Büsser and his friends, you can feel like having a 1970s Lamborghini on your wrist – with the MB&F HM5 – go back in the 19th century with an interpretation of what could have been a modern watch made by the brand at that time – with the MB&F LM1, LM2 or LM 101 – imagine you have a frog or an owl laid on you wrist – with the HM3 Frog or the HM3 Jewelry – or finally keep an eye on the pin-up applied on the reactor of your plane – with the HM4 Razzle Dazzle. 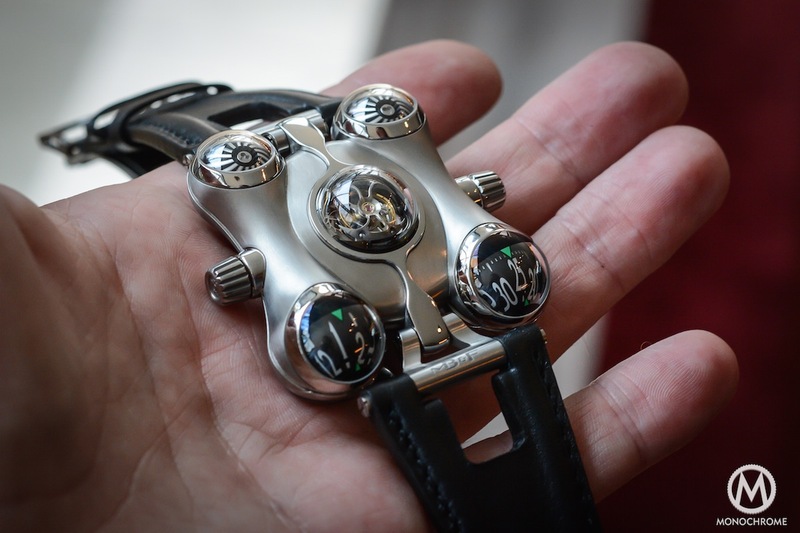 We told you, together with the concept of partnerships, the idea of inspirations is crucial in the work of MB&F. 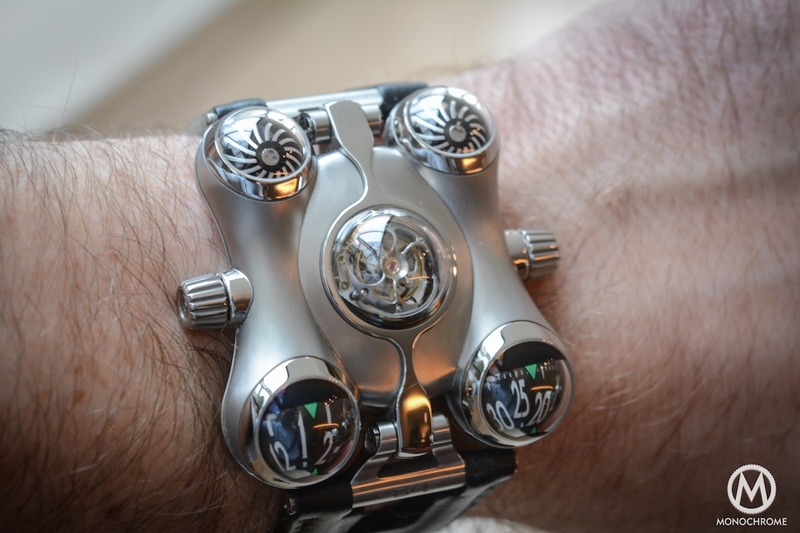 The new MB&F is said to be inspired by the famous 1970s cartoon ‘Captain Future‘ or Captain Flam’ (depending on where the show was broadcasted). Captain Flam had a spaceship called The Comet that consisted of two spheres joined by a connecting tube. 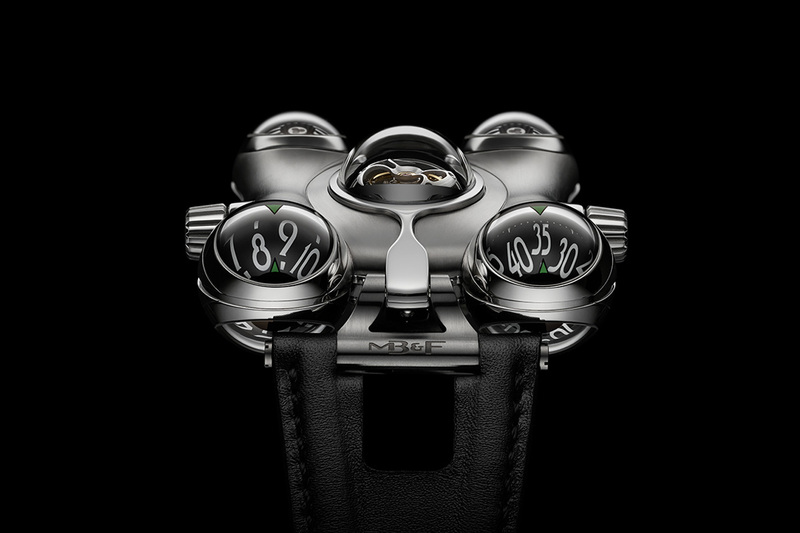 Using the idea as a base, the MB&F HM6 uses sapphire spheres linked together by a central ‘tube‘ or ‘fuselage‘. The HM6 has something in common with the HM3 Frog – for the domes – and with the HM4 – for the overall architecture. While the previous watches of Max Büsser were mechanical, this one seems more organic, mixing futuristic codes with vintage, outdated design elements, creating a softer, rounder result. 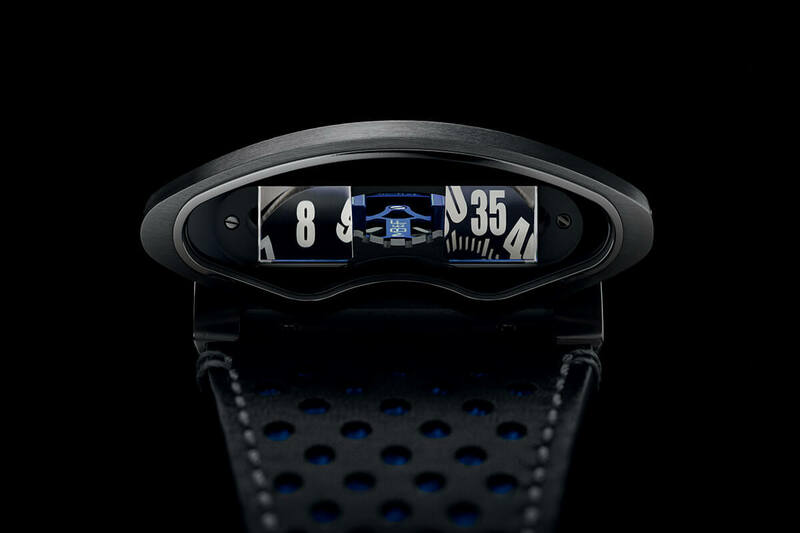 The case (quite massive at 49.5 mm x 52.3 mm x 20.4 mm) is machined from 2 solid lingots of grade 5 titanium and a central titanium band wraps lengthways around the case, with a circular aperture on top. It both strengthens the structure and acts as a support for the moving lugs. 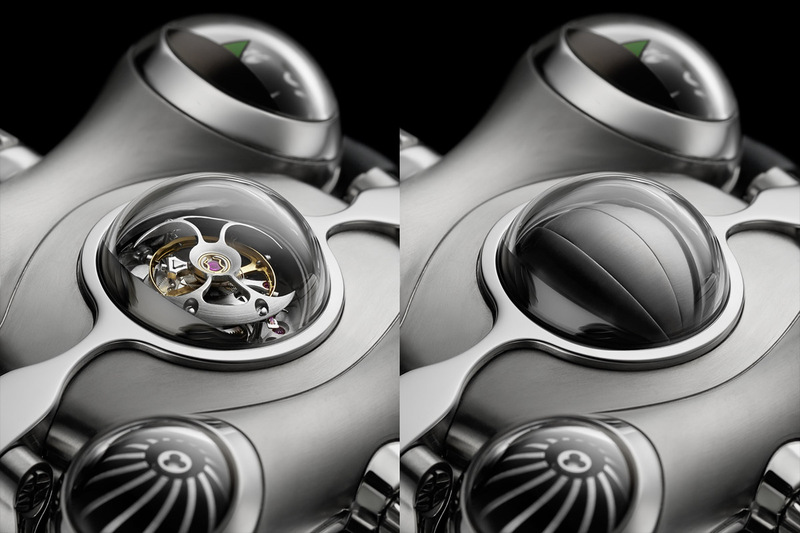 To show show the timing indications (and another cool thing on which we’ll get back later), the MB&F HM6 uses 9 domed sapphire crystals – 2 for each corners and one in the center to show the regulating organ. Another one on the case-back allows a view on the movement. You can find 2 crowns on the Horological Machine 6: one to wind the movement and set the time – indicated by 2 rotating domes, one on the left for the hours and one of the right for the minutes, just like the HM3. The second crown on the left side is used to open / close the shield that sits upon the regulating organ in the middle of the ‘Space Pirate‘. 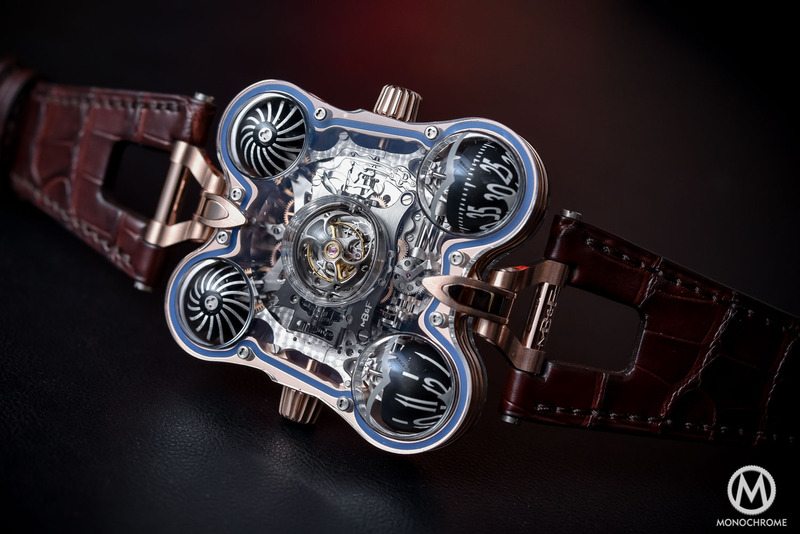 To achieve this very unusual display, the movement is of course quite complicated: a regulating organ on the top, a winding rotor on the back, hours and minuted indicated by semi-spherical aluminium domes on a vertical axis when the movement is classically horizontal. 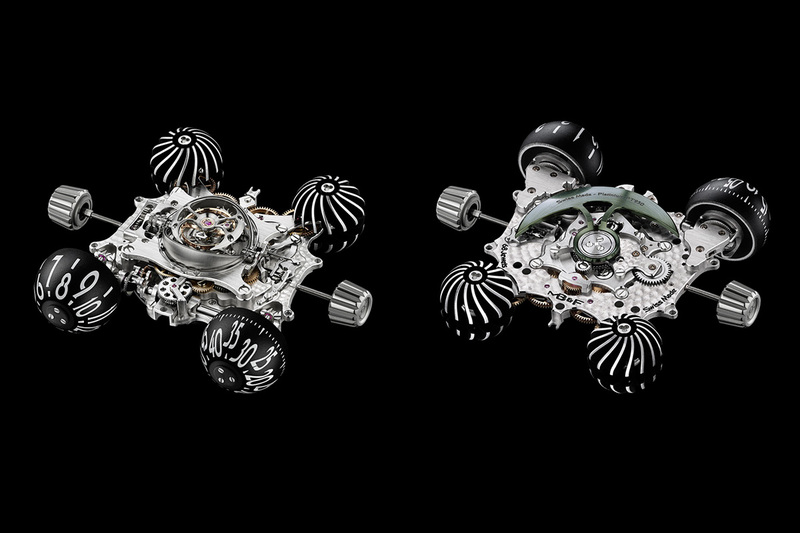 First of all, the movement had been created exclusively for MB&F with David Candaux Horlogerie Créative and required 3 years of development. The complexity comes essentially from the different axes, thus involving many pivots and gears trains to transfer power from the central part to the extremities of the watch. 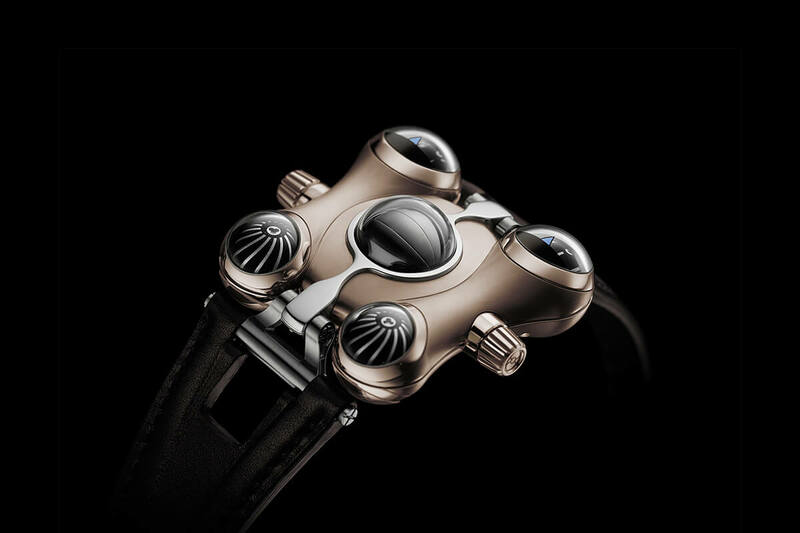 Then, to regulate this ‘engine’, the MB&F team chose to use a flying tourbillon – as we told you displayed in the middle of the watch and that can be protected by a retractable spherical shield that envelopes the tourbillon with six overlapping, curved blades (activated by the left crown). 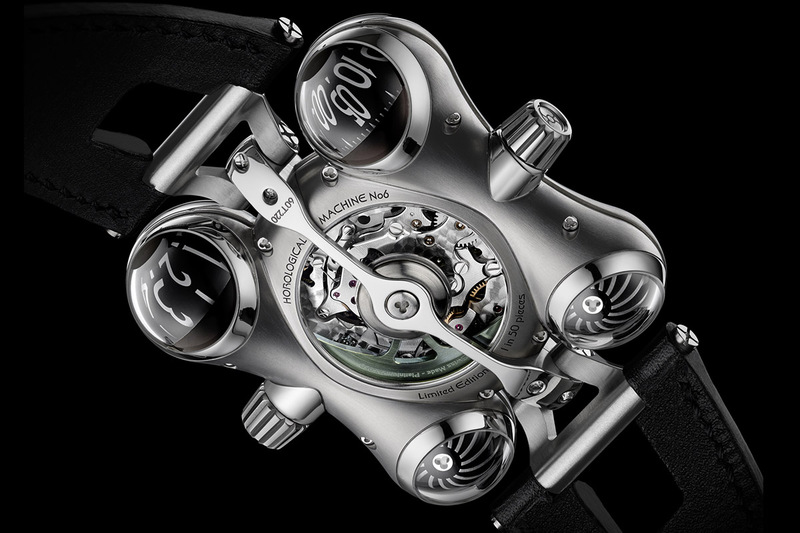 The automatic movement ticks at 18,000bph (2.5Hz), boasts 72 hours of power reserve and is composed of 475 pieces. Last but not least, here comes the cool feature (yes the other ones were already cool, but this one is cooler). 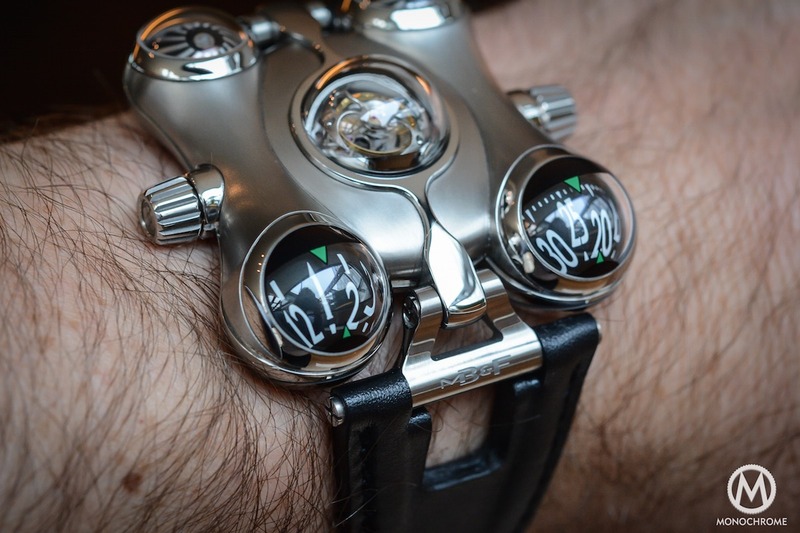 This leads us to the 2 other domes on the back of the MB&F HM6 ‘Space Pirate’. The two spherical turbines – composed each of 15 curved vans, machined in solid aluminum blocks – are used to regulate the winding efficiency. These turbines are driven from the rotation of the winding rotor by a gear train designed to amplify the number of rotations. If the winding rotor starts rotating too quickly (due to excessive movements of the wrist), the air friction on the turbines will slow the winding and protect the movement. 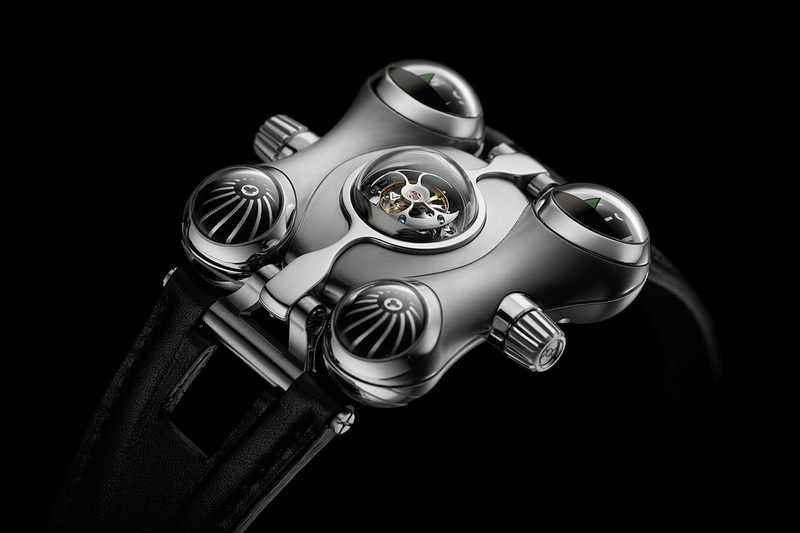 Something quite similar can be found in several URWERK creations – such as the UR-210 AlTIN & UR-202 White Shark. Maybe not the most essential feature of the HM6 but it is still very cool to see in action. 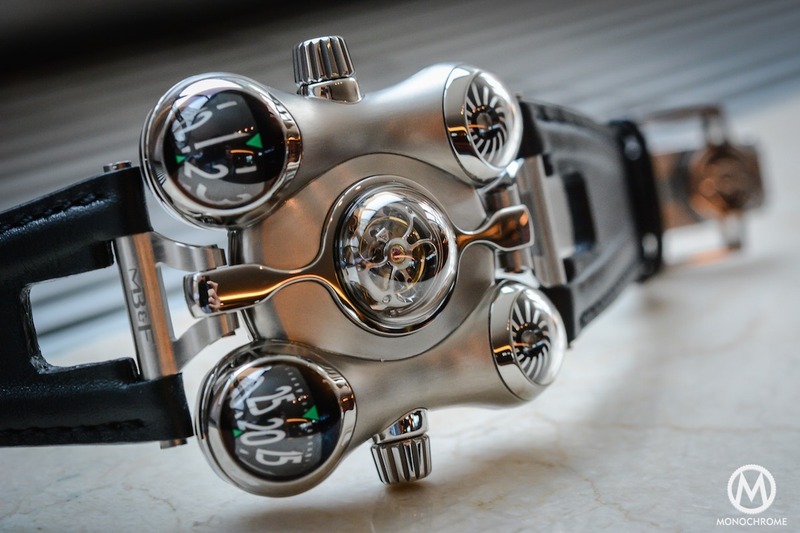 The new MB&F HM6 / Horological Machine N° 6 / Space Pirate (production of this titanium edition limited to 50 pieces) is once again a completely crazy creation from Max and his friends. It is far from being cheap (CHF 215,000 with taxes), it is complicated, it has a resolute, extreme and strange design, it is big and looks like nothing else. 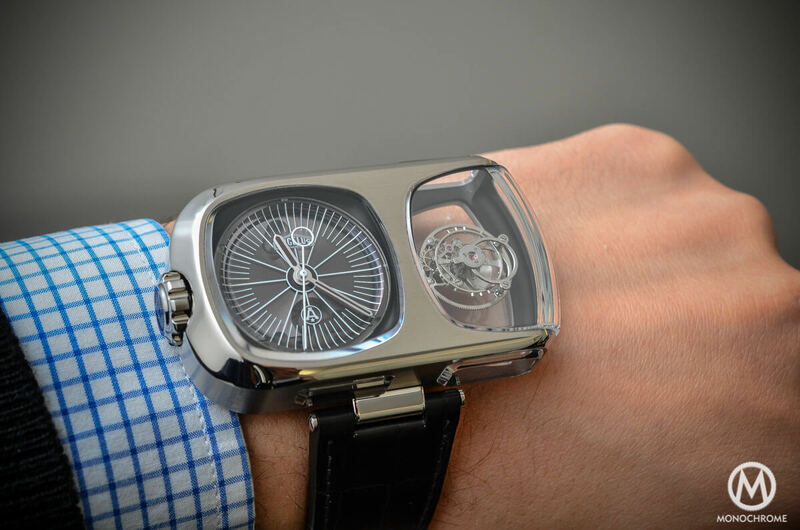 The MB&F LM 101 was the reasonable and rational offer of the brand. This one could be the most extravagant of all the creations. It is clearly not make to be loved by everyone and it will for sure shock some of the collectors – a debate is already running into the Monochrome-Watches team to know who like it or not. Putting aside personal tastes, does the HM6 is justified: YES, just for the sake of the (horological) art. Will it be easy to sell: Maybe NOT, considering the market, considering its price and considering the totally unusual design. 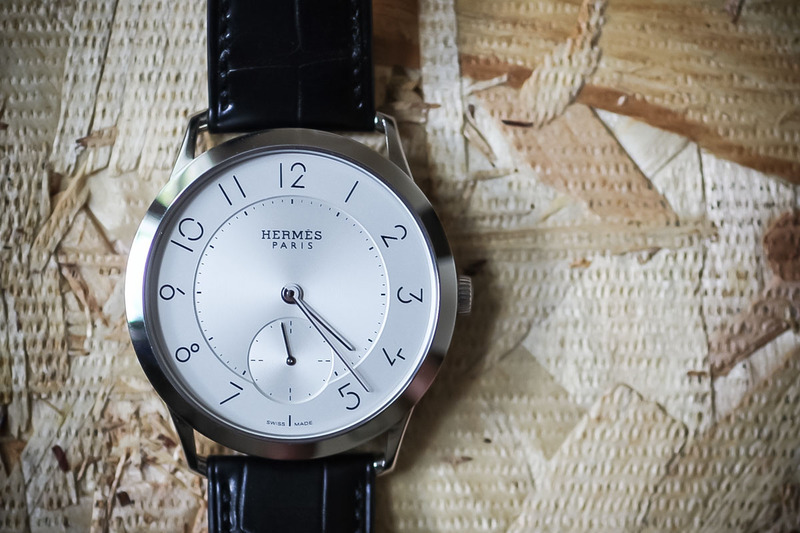 Whatever, it shows once again that independent watchmakers are as crazy as we are about watches. That’s the good point here. Movement: Three-dimensional horological engine developed exclusively for HM6 by MB&F with David Candaux Horlogerie Créative, Flying Tourbillon with retractable shield, Iridescent green platinum 950 battle-axe automatic winding rotor, Twin aluminum turbines driven by winding rotor, Power reserve: 72h, Balance frequency: 18,000bph/2.5Hz, Number of components: 475, Number of jewels: 68. Dimensions: 49.5 mm x 52.3 mm x 20.4 mm Number of components: 80.